Camping without beer is just sleeping in a box. 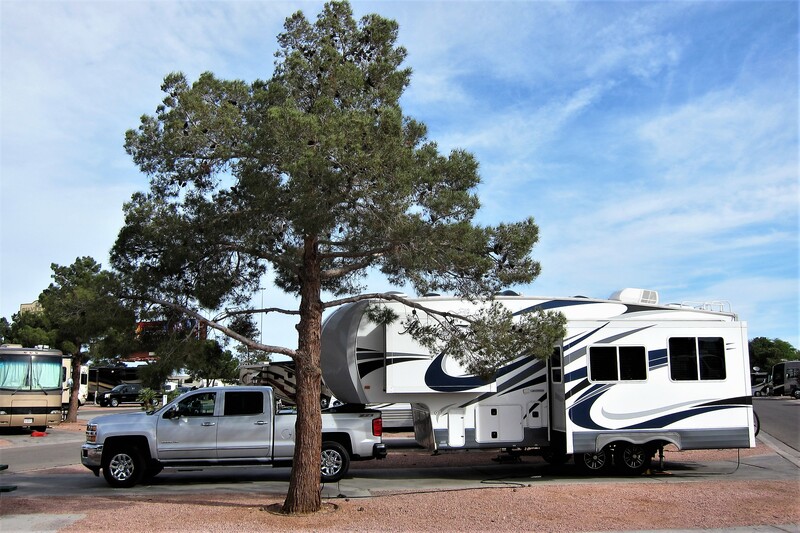 Monday, April 17, 2017: Final morning at Oasis RV Park in Las Vegas for this year, as today Kit and I continue our eastward trek toward home. Broke camp and pulled out at 0917 under partly cloudy skies and a temperature of 75 degrees. 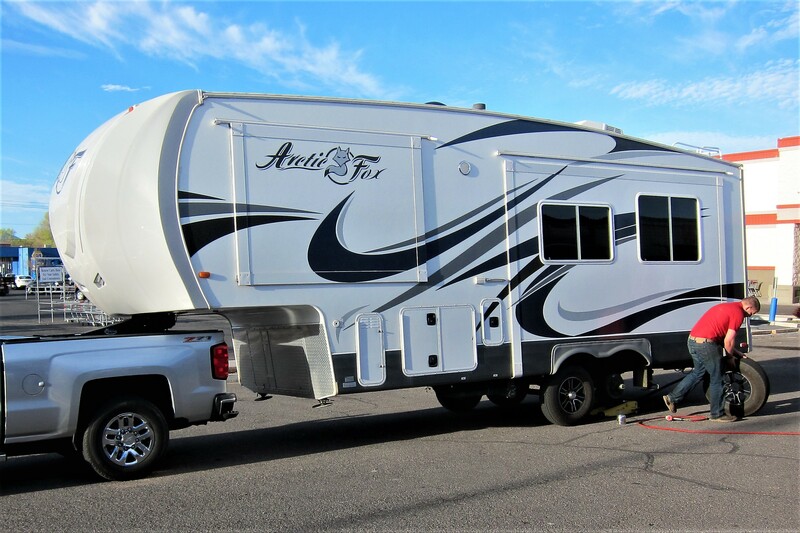 While winding our way through this vast RV Park, a woman waved excitedly and pointed at the side of our camper…taking a glance in the driver’s side rearview mirror I saw the bedroom slide was still extended!?!? First time that’s happened! Even though we have many years’ experience, and use a detailed check sheet before departure, mistakes can still occur. Fortunately, that slide only extends 16 inches and we hadn’t left the campground premises, so no harm. 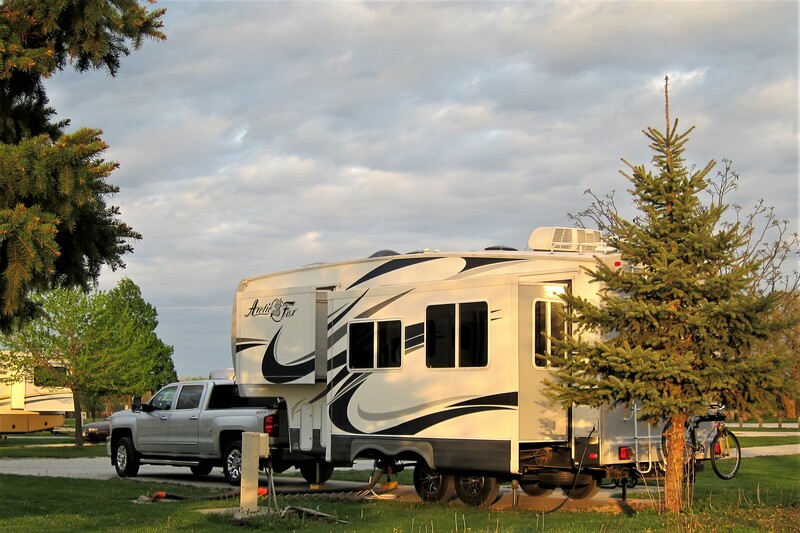 Kit or I have alerted many other campers of similar situations concerning their rigs over the years, so blunders of that nature are more common than one would think…fortunately, RV’rs tend to look out for each other. 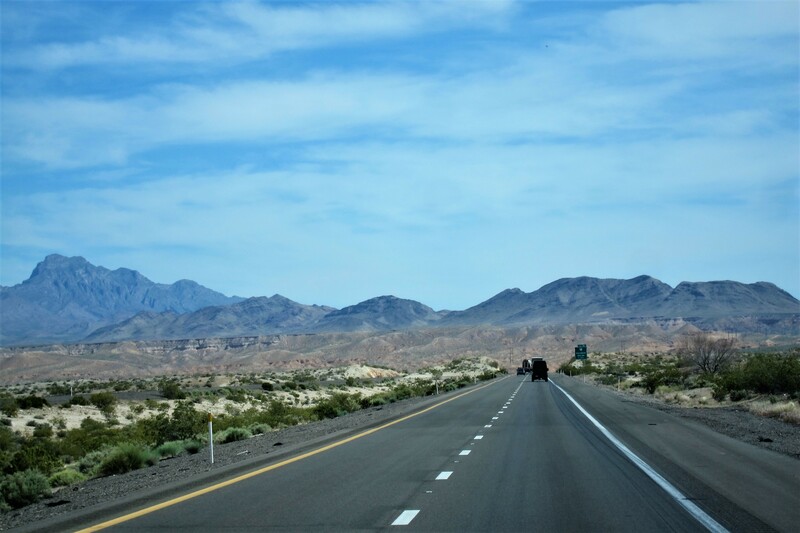 Driving on Interstate 15 heading north, we soon left the congestion of Vegas traffic and eased into the vast desert. Snipping the extreme Northwest corner of Arizona, we then crossed into Utah at 1123 and promptly lost an hour because of transitioning to the Mountain Time Zone. 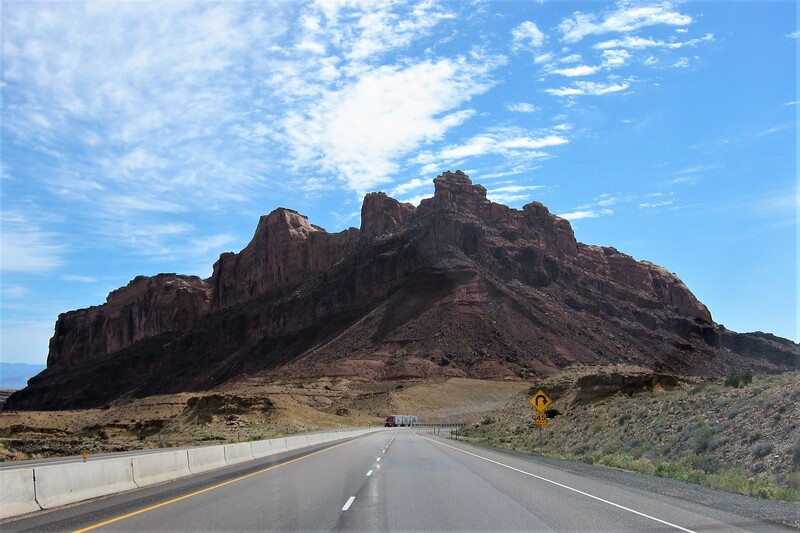 As a benefit, this loss of an hour gained us access to the famed Red Rock area of Southern Utah. 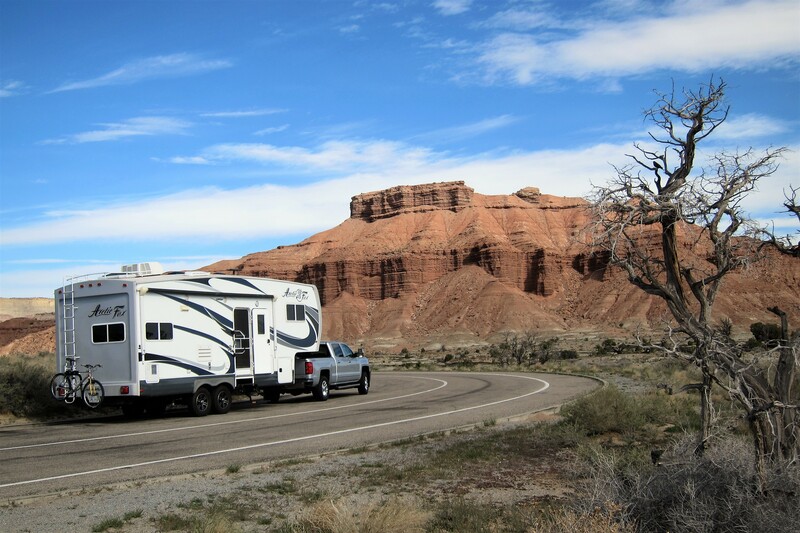 After nine extended winter RV trips during which Kit and I have visited every state in the lower 48, our favorite southern states to explore are…California, Arizona and Utah. And, in our opinion, the latter has some of the most beautiful landscapes around! 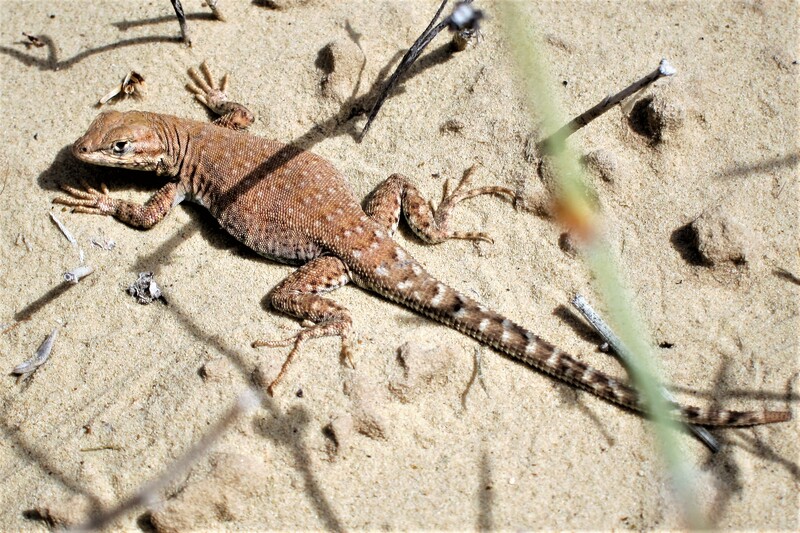 These vast areas are sparsely populated and mainly inhabited by hardy creatures, such as the iconic Southwestern Lizard. Who seem to be scampering about at every stop, darting from their protective cover of rocks or bushes to see who was intruding upon their domain. 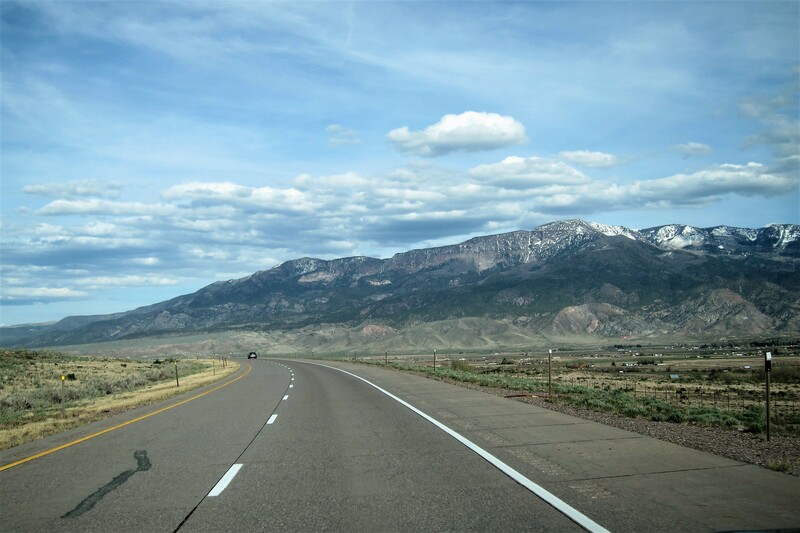 After a refreshing lunch break in one of the nicest highway rest areas of this trip, we continued north until intersecting Interstate-70 where we turned the rig the east. A few hours later it was time for another stop, so into a rest area we drove and sidled up to our camper’s twin! 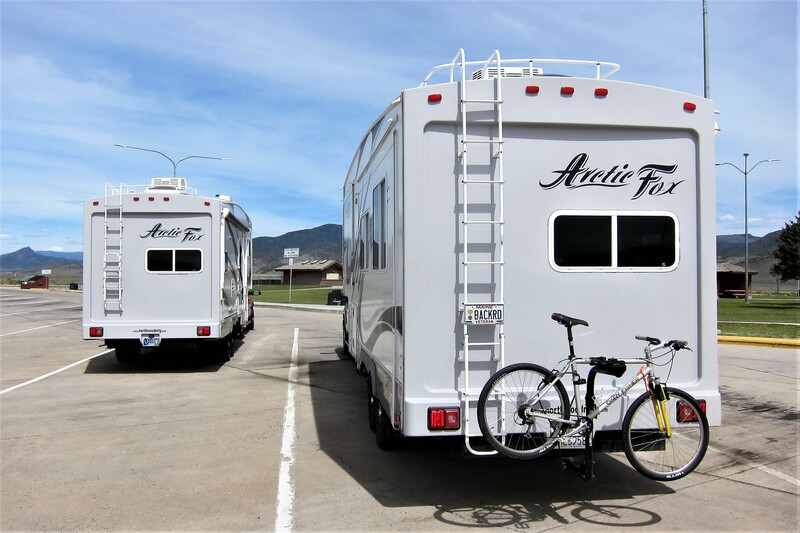 The owners of the identical Arctic Fox 27-5L were a nice couple from Montana. Kit and I spent about 30 minutes talking about our respective rigs, how we had modified them, and the places we’ve traveled…another in a continuing series of forging serendipity friendship’s. Back underway and continuing east, Kit began looking for our next overnight camping opportunity. 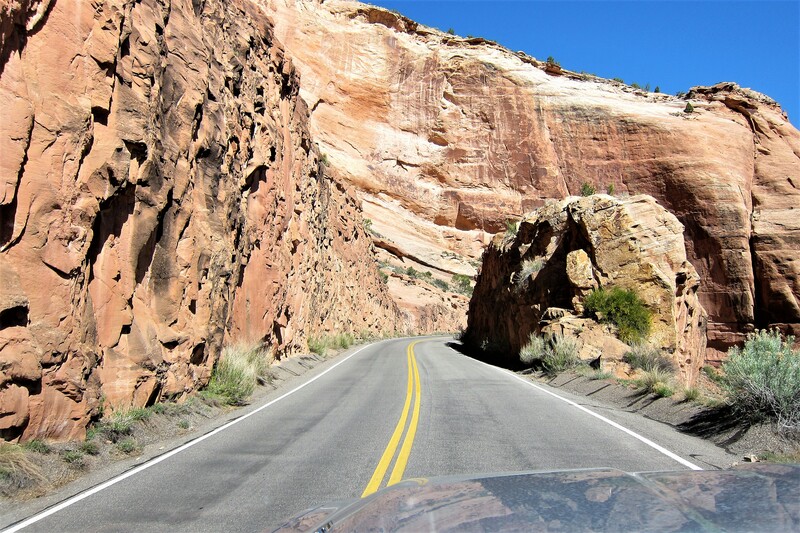 Over the years, we have extensively explored Southern Utah and its many famous National Parks…so this trip the decision was made to skip these in favor of making more progress toward the east. 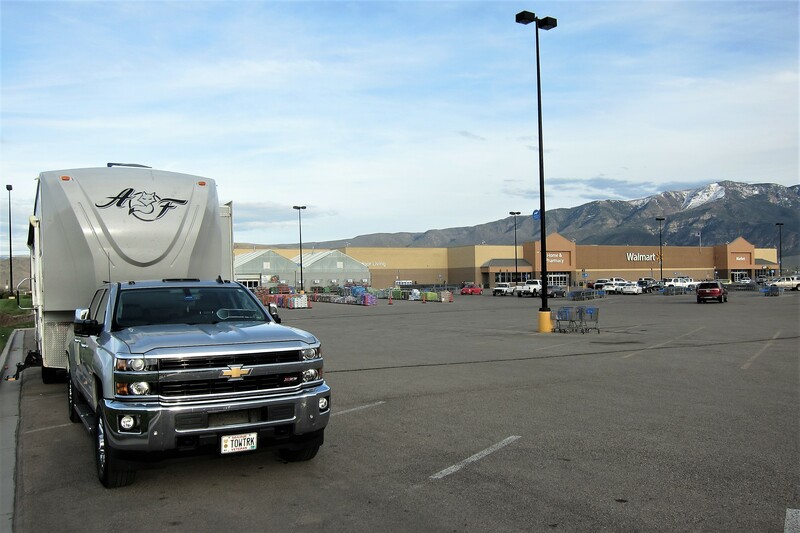 Kit found an RV friendly shopping center using the All Stays App, where we stopped for an evening of “Blacktop Boondocking” at the Wal*Mart in Richfield, Utah. Following some shopping and walking around time, we ordered some Subway sandwiches for dinner, then spent the evening on our computers while watching the coming and goings of cars, trucks and other RV’rs as the sun set over our urban campground. 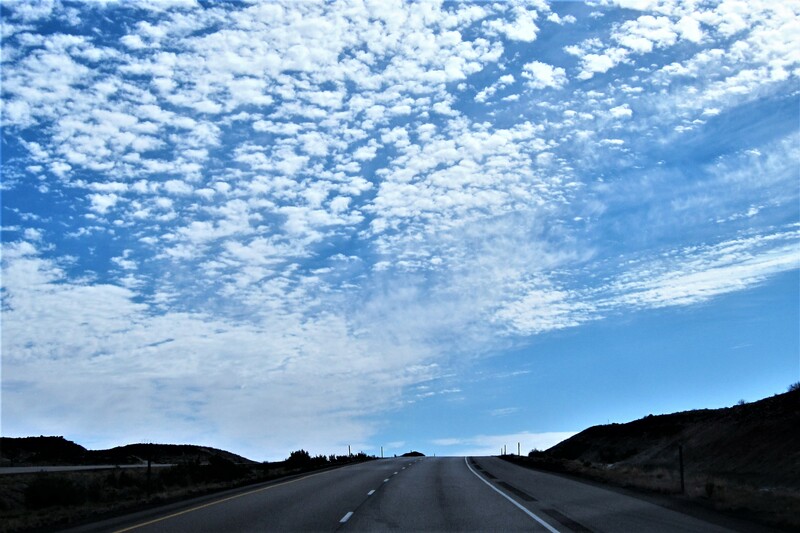 Tuesday, April 18, 2017: Woke to a temperature of 48 degrees…at an elevation of 7,000 feet of elevation, the weather is a whole lot different than yesterday’s desert environment! This is the first morning in months we’ve had to use the heater. One of my routines before departure is to check the rig for anything amiss and part of that is to check all eight tires for proper pressures and look for any unusual wear patterns. This morning, I noticed the left rear trailer tire was exhibiting some tread separation, so since a tire shop was just down the road that was where we headed first. The offending tire was the last of the OEM tires and at close to 30,000 rugged miles was due for replacement soon anyway. The shop made quick work of changing out the tire and we were rolling out of town by 0830 hours. 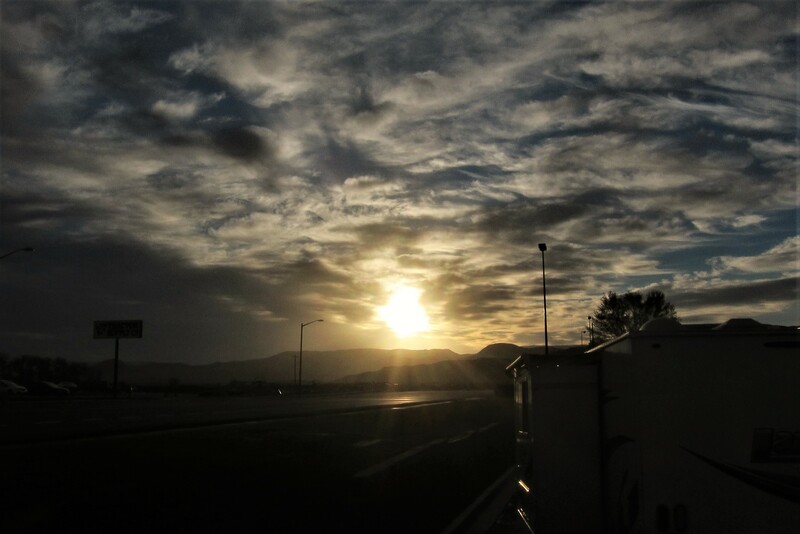 Back on Interstate-70, we continued to roll toward the East as the sun was slowly rising. Crossing over the Colorado border shortly before 1300, the imposing Rocky Mountains began to come into view. 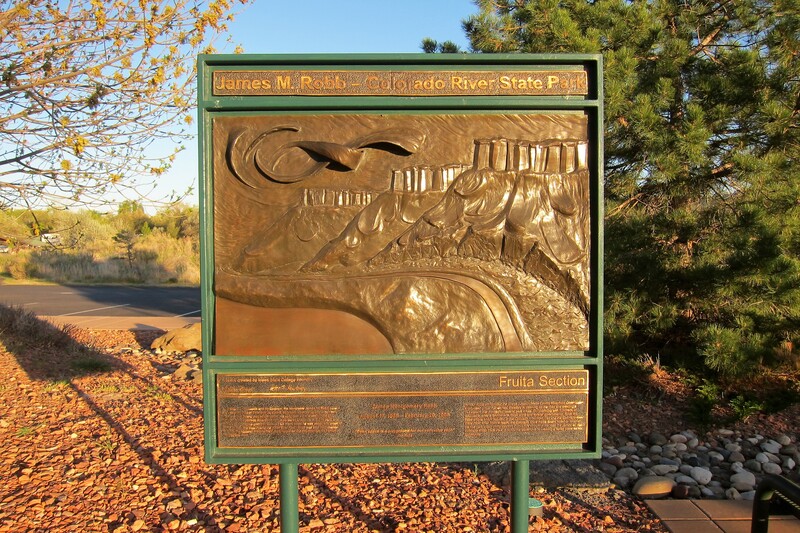 Thinking it would be prudent to make the trek over the Rocky’s in the morning, Kit and I decided to stay the night at a nice riverside state park located near the town of Fruita, Colorado. In fact, it was so nice that we made the decision to stay two nights! 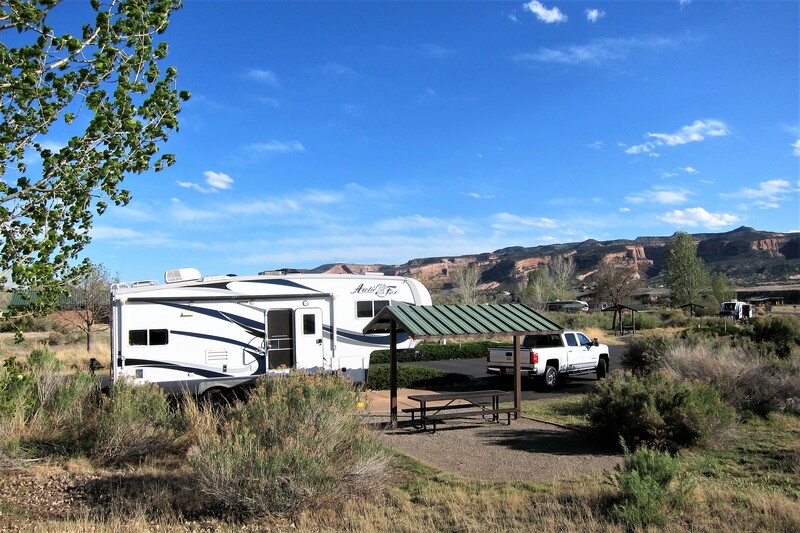 Walking about the campground along the Colorado River, reaffirmed our opinion that the various state and municipal state parks are far superior to most commercial campgrounds. 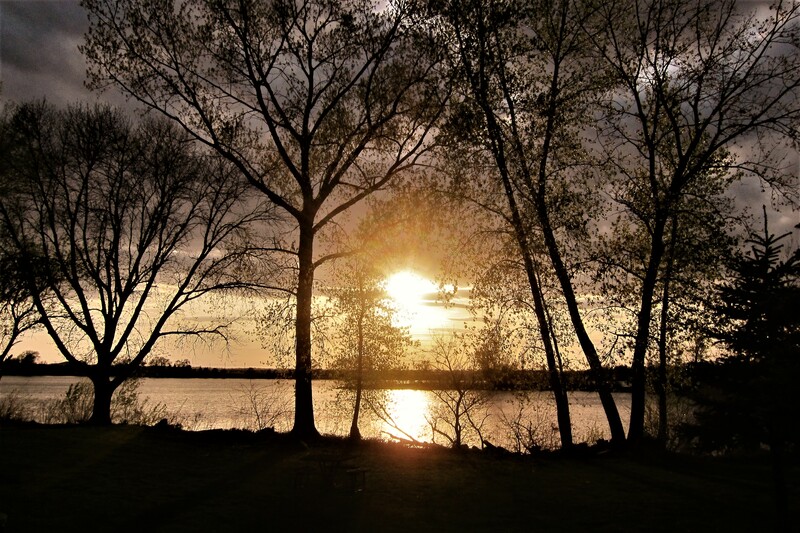 Enjoyed a camper cooked meal, a few glasses of wine, and a dramatic sunset over the river. 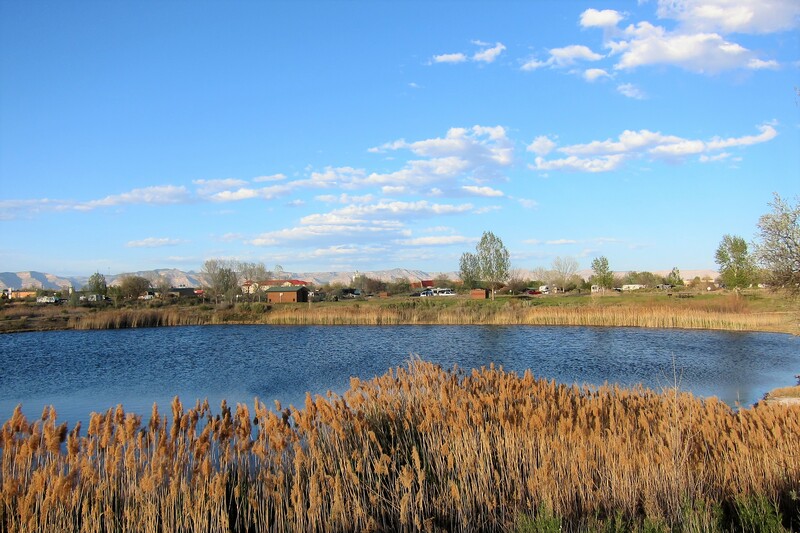 Wednesday, April 19, 2017-Fruita, Colorado: The town of Fruita is the gateway to a little-known unit of the US National Park System…so on this bonus day off the road we decided to explore this interesting park. 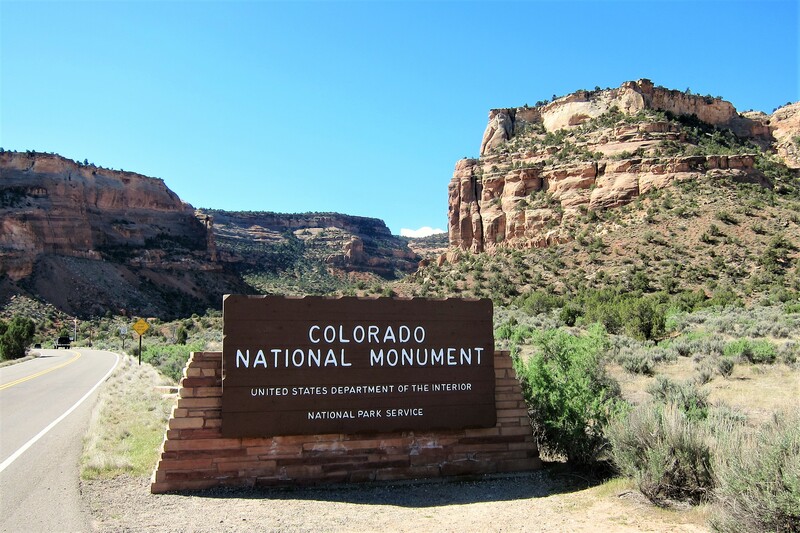 The 32-square mile monument located on the Colorado Plateau is defined by spectacular canyons cut deep into the sandstone revealing many layers of geologic history. Designated as a National Monument by President Taft in 1911, the park was accessible to only the most intrepid visitor. Then in the 1930’s, the depression era Public Works Administration (PWA) and the Civilian Conservation Corps (CCC) constructed Rim Rock Drive which opened up the monument to more folks. 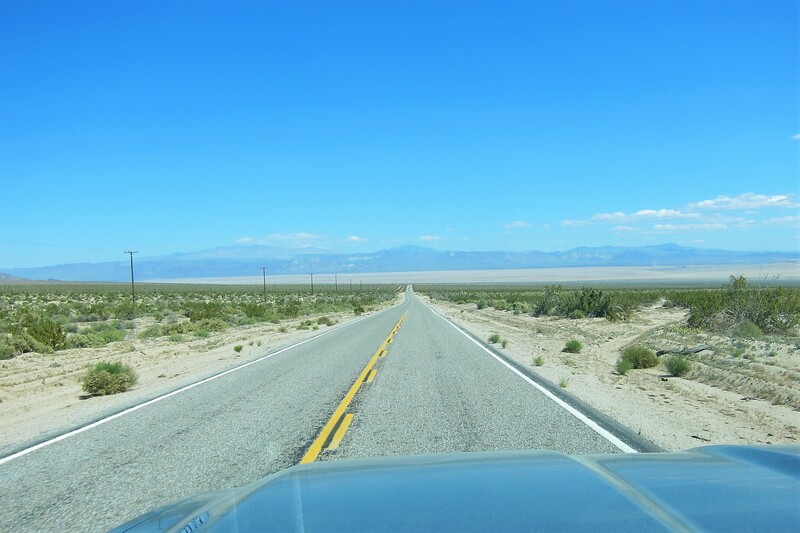 The 32-mile serpentine road covers only eight linear miles and was built using manual labor by a crew of approximately 800 men. 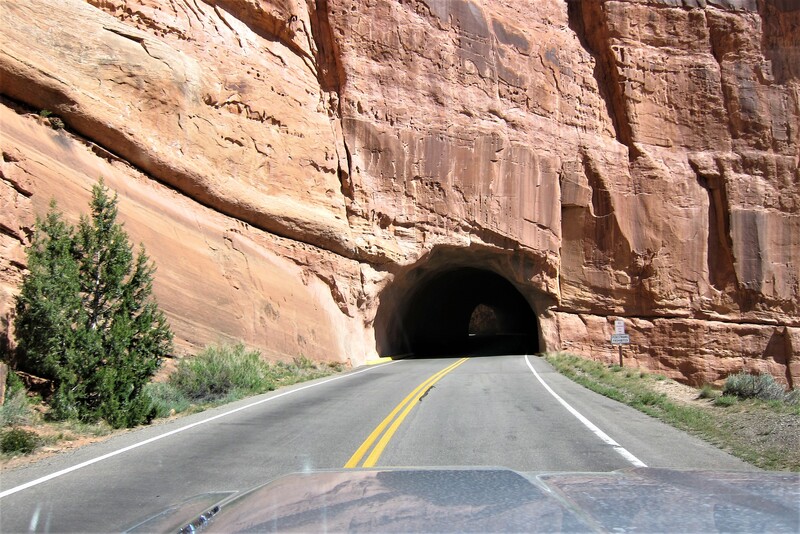 In addition to slicing through sandstone, there were three tunnels bored through the rock. 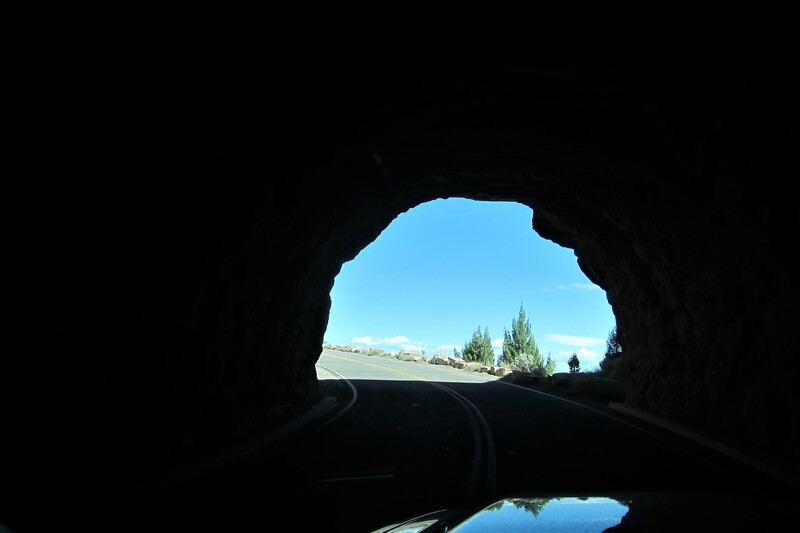 Which creates a unique sensation as one drives from utter darkness into the brilliant Colorado sunshine. A bit disconcerting what with no guardrails and a 300-foot drop!?!? 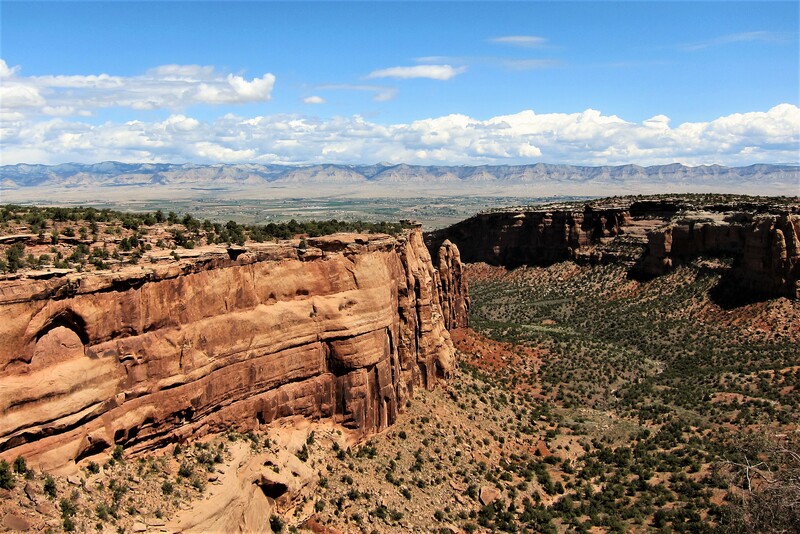 Once at elevation, Rim Rock Drive meanders along one of the largest flat top mesas in the world where incredible views can be enjoyed. 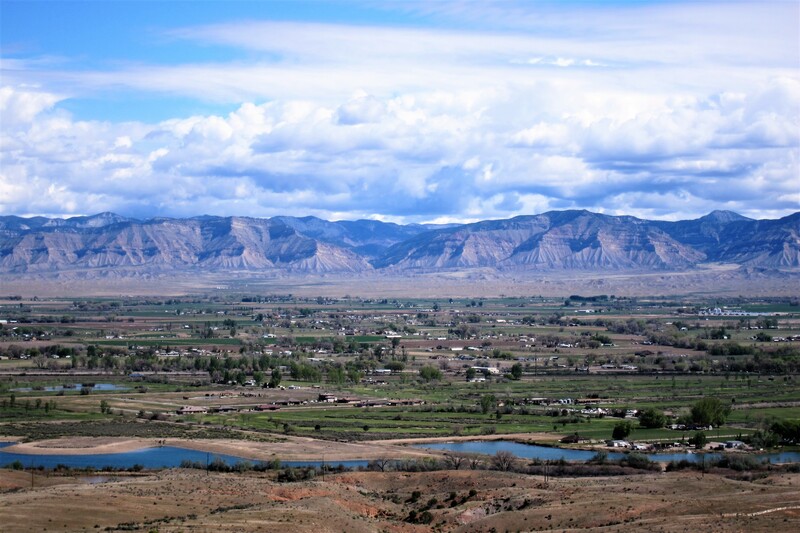 On this beautiful clear day, we could see the town of Fruita, and further in the distance the city of Grand Junction with the foothills of the Rocky Mountains on the horizon. 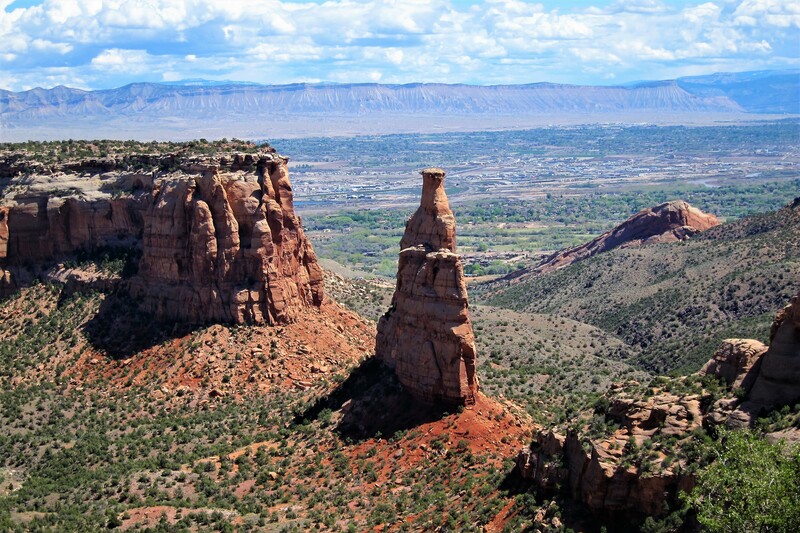 There are a number of Turnouts to pull off allowing for walking about and gazing at some of the more unique rock formations, such as the 450-foot-tall Independence Monument…a prime desert tower rock climbing venue. Protected by a solid capstone, Independence provides a challenging scramble to the summit for experienced climbers. At one of the Turnouts, we came across this fellow. 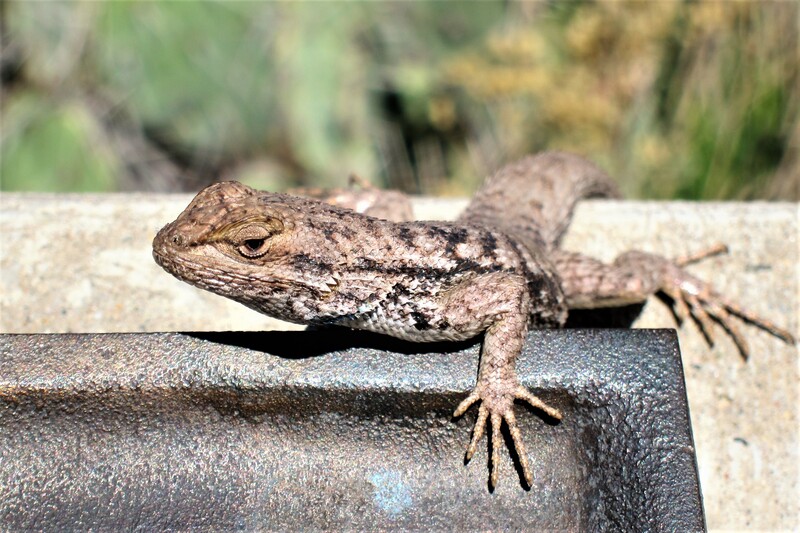 Lizards are all over the Southwest, and are relatively easy to photograph with my weenie camera…unlike the many winged critters that fly about. Along the drive there are areas that feature picnic shelters, one of the nicest is this place where we stopped to enjoy our lunch. 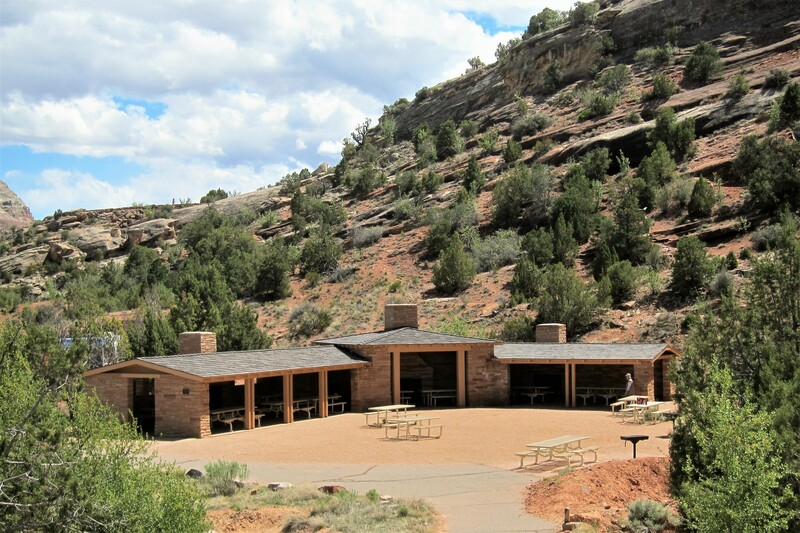 Nestled into the sandstone cliffs, the shelter features covered as well as open tables. 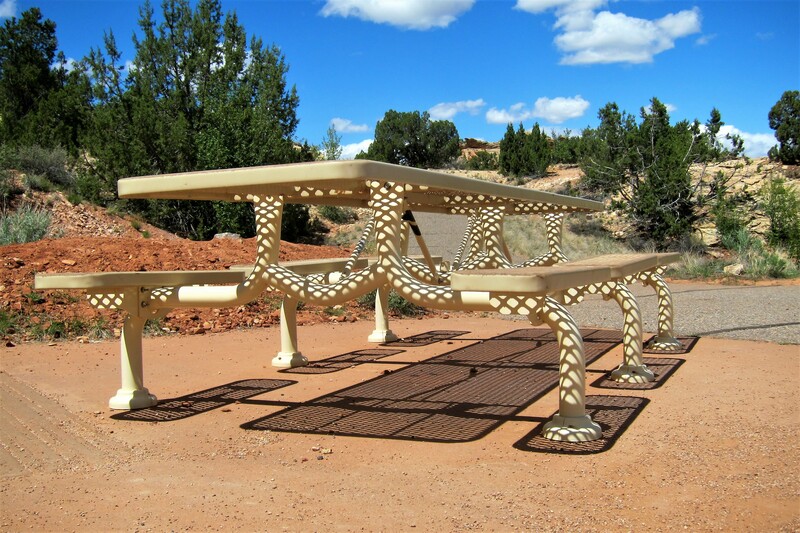 I was intrigued by the sun shining through the open weave design of the picnic tables which cast an unusual shadow pattern on the ground and the table legs. Not sure why unusual geometric designs like that impress me, but they do! Heading back to the campground, we made a stop in downtown Fruita. 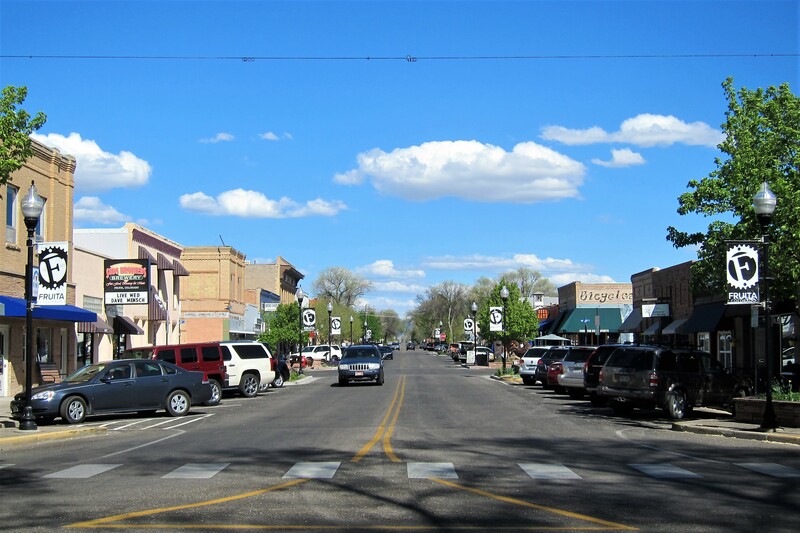 This village of 12,640 folks bordering the Colorado River started life as a fruit grove, hence the name. 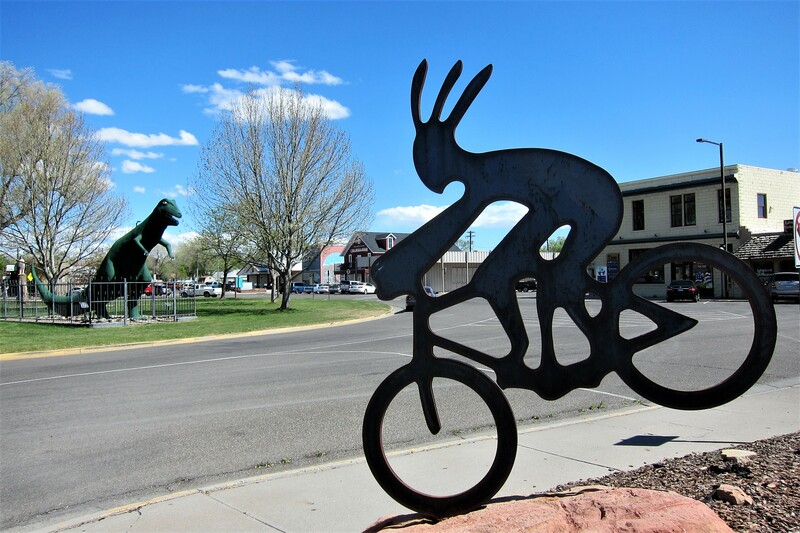 Today it is a regionally popular outdoor recreation venue and one corner of the famed Dinosaur Diamond Byway, a 512-mile circuit that connects several prehistoric fossil sites. Throughout the town there are reminders of these two obsessions. 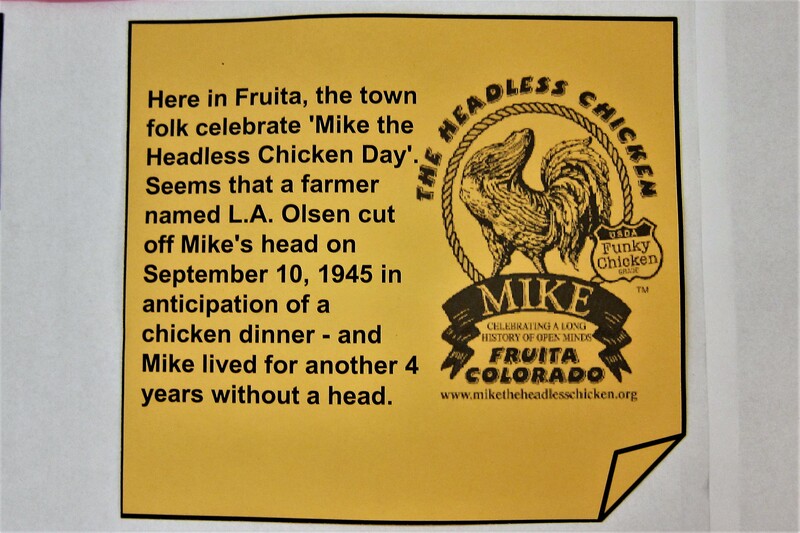 Another claim to fame of Fruita is Mike the Headless Chicken. Interesting read…throughout my life, I have encountered some people that act like Mike! Back at the state park, Kit and I relaxed about the ground’s taking in the beautiful weather and enjoying the scenery. Also, our final sunset while West of the Rockies. Tomorrow it is up and over the Big Hill on our quest toward home! Thursday, April 20, 2017: Woke to news of a pending storm bearing in from the west that is slated to bring snow and sleet to higher elevations. Wanting to move east, without being stuck in the Rockies, Kit and I departed the campground at 0750 hours and headed for the hills. 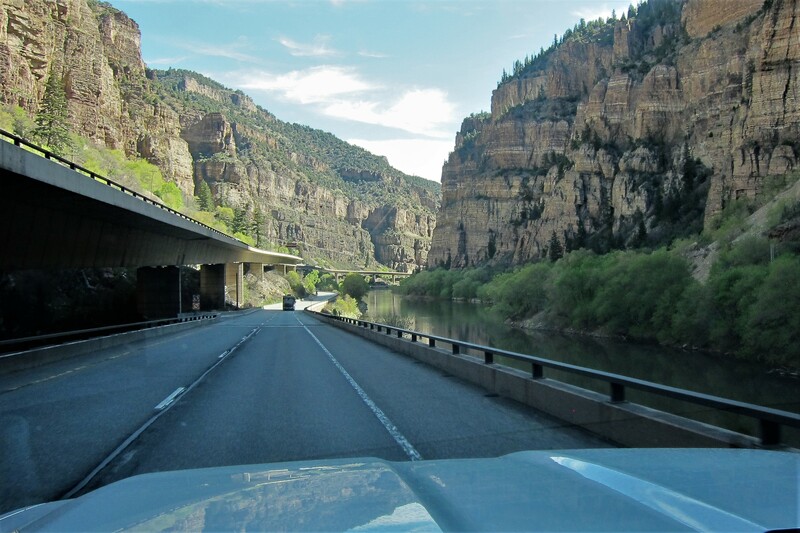 Continuing Interstate-70 we paralleled the narrow Colorado River valley…so narrow, that the highway heading west is stacked over the one heading east. Gaining altitude brought us views of lofty snowcapped peaks. 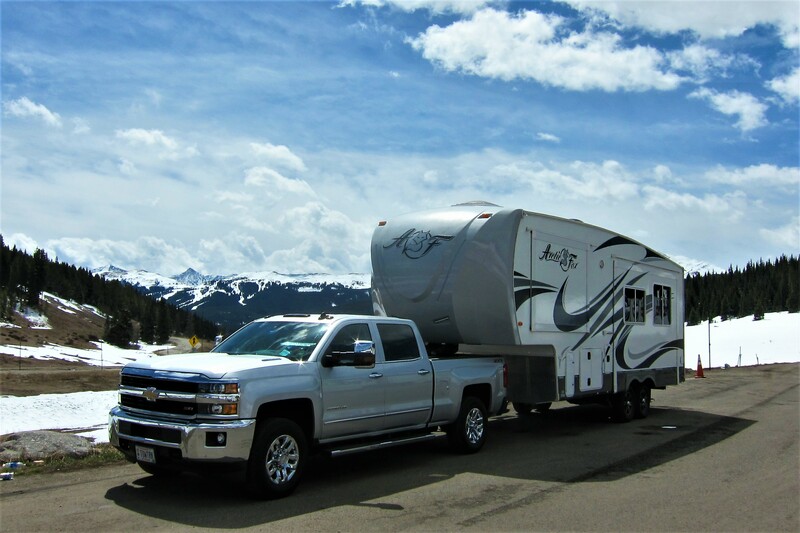 At 10,662 foot Vail Pass it was time to pull over for breakfast and the obligatory “camper in the Snow” photo shoot. Since it looked a bit ominous to the west, we didn’t dally long but continued eastward climbing into the upper reaches of the Rockies. I generally take such long and steep climbs a bit slower than I need to with this diesel truck, but concerned with the looming storm I drove a bit faster. Apparently, the truck didn’t like the thin air coupled with the heavy engine load, and I received a warning on the console to slow down due to turbo overheating. Tucking in amongst the long-haul truckers crawling up the grade, the turbo cooled and the truck returned to normal…lesson learned! Topping out at 11,158 feet we punched through the mountain via the Eisenhower Tunnel. Bored in the 1970’s in order to bring this portion of I-70 into compliance with the Interstate Highway system. 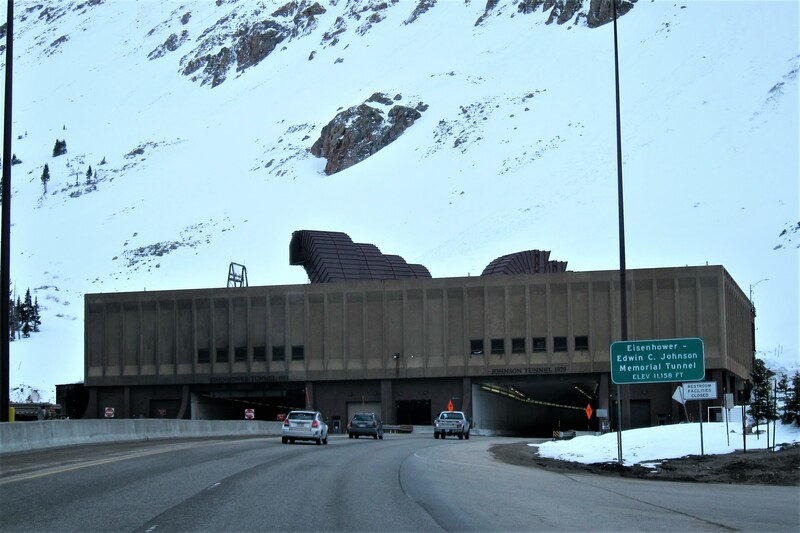 The Eisenhower Tunnel’s altitude and length make it one of the most unusual highway structures in the world. 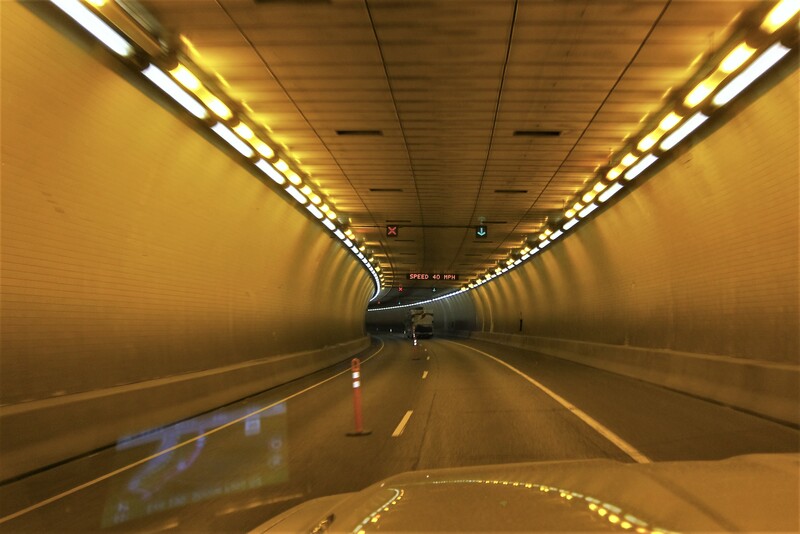 The tunnel features a unique traffic control system…it monitors a vehicles height, width and weight, then sets the speed limit for the safety of the largest vehicle entering, in our case 40 MPH. 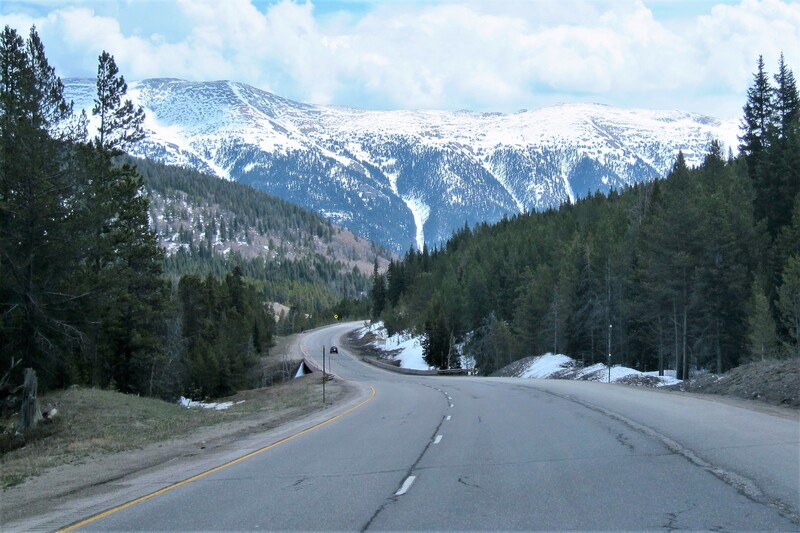 Exiting the Eisenhower Tunnel, we began the long steep decent down the Eastern Slope of the Rockies, through the city of Denver and toward the town of Aurora, Colorado. 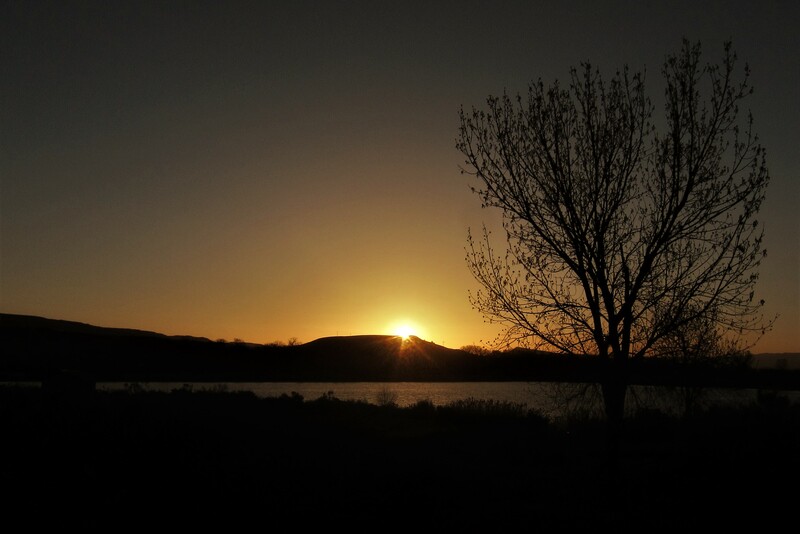 Nearby, we found Buckley Air Force Base and stopped for the evening at their very nice lakeside Recreation Facility. 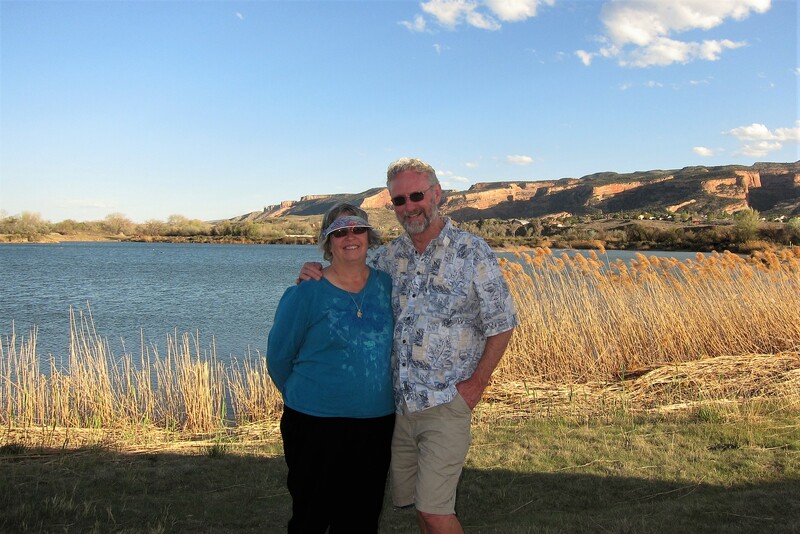 Following dinner, Kit and I enjoyed the sunset while toasting our successful crossing of the mighty Rocky Mountain’s. Goodnight! Stay tuned for another addition/edition/eposide/chapter of Bill and Kit’s Excellent Adventure…coming soon! Kit’s Bit’s: After a few months of easy travel and many stops, we had to adjust to a more arduous schedule. Plus, the weather was becoming a factor. We had to dig out our winter duds and stow the summer clothes. Wind, snow and rain were becoming factors to consider. Fortunately, we had enough time to get home that we could stop after two or three days of driving, to rest up. We also had a couple of nice days; cold, but sunny, which made the harsh weather a bit more bearable. And, for me, seeing nice green trees was a huge treat! Loved your trip thru Utah! I agree…the landscape is absolutely stunning! Both of you would make ideal spokepersons for our beautiful nat’l parks! Ah, better yet…..save the pics for your book!! 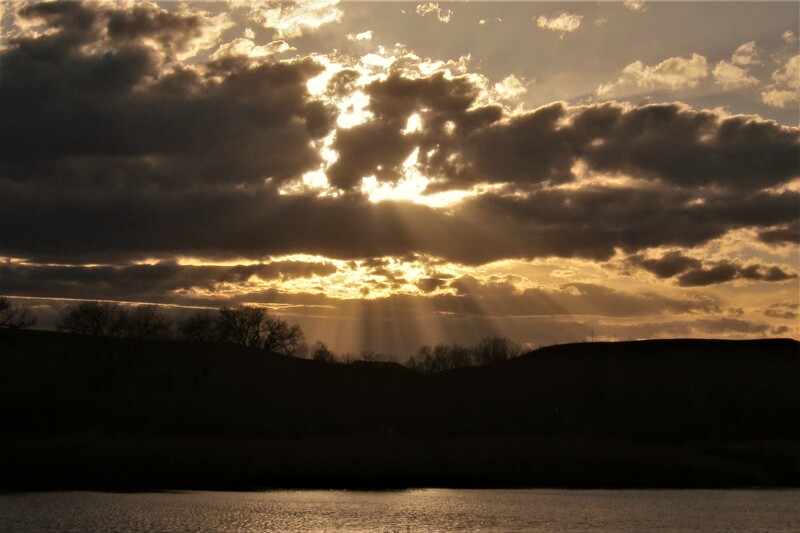 The sunset pic taken near Fruita was beautiful…I expected to see angels coming down on the sun’s rays! ..Views from Rim Rock Drive were indeed incredible! 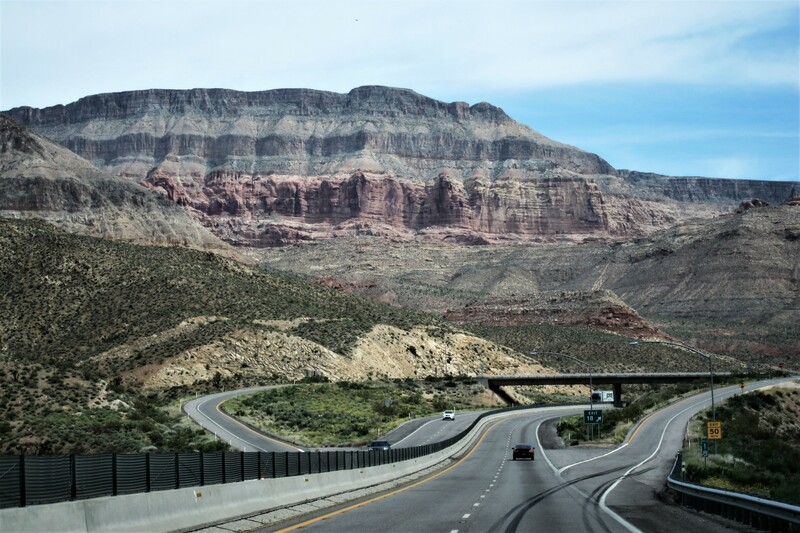 NO guardrails!…Very nice shot of the Rockies.. The hx on Eisenhower Tunnel and its traffic control system were beyond impressive. ….Glad you guys made it safely over….and through…the Big Hill!